A Singaporean tutor has admitted to helping six Chinese students cheat in their 2016 exams in what prosecutors say was an elaborate plot. Tan Jia Yan took the exams as a private candidate and FaceTimed questions to accomplices who then rang students and read the answers to them. The students snuck in mobile phones and Bluetooth devices, and wore skin-coloured earphones during their exams. Ms Tan on Monday pleaded guilty to 27 charges of cheating. 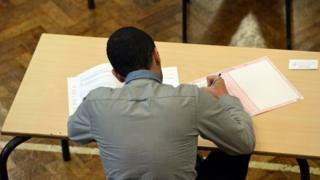 The exams were the O-levels, typically taken by students aged around 16-years-old. Three other suspects face similar charges. The plot was uncovered after an invigilator noticed unusual sounds coming from one of the students involved, the prosecutors said. The student was taken aside after his exam and asked to remove his vest. A mobile phone, Bluetooth device and skin-coloured ear piece were found on him. The prosecutors said during the opening day of trial that Ms Tan and her accomplices had helped the six students to cheat in their exams at the Singapore Examinations and Assessment Board in October 2016. The "cheating operations" were "highly sophisticated", Deputy Public Prosecutor Vadivalagan Shanmuga said, Channel NewsAsia reports. Ms Tan was employed at Zeus Education Centre at the time. The other three suspects are Poh Yuan Nie, the centre's principal, and her fellow teachers Fiona Poh Min and Feng Riwen. They are contesting the charges against them, and are expected to go on trial later this week. Poh Yuan Nie is alleged to have received from a Chinese national S$8,000 (Â£4,260; $6,100) as deposit and S$1,000 for every student referred to the Zeus Education Centre. The money was to be fully refunded if the students failed their exams. Russia says investigators will be allowed to visit the alleged chemical attack site on Wednesday. What are NDAs and are they bad for women? Comey may be many things, but i s he really a liar? Challenge prizes take innovation outside the research establishment - and they are becoming more popular.